Edge OLED Display, which is used for Samsung Display’s Smartphones, is going to be used for Chinese Smartphones. This is a result of diversifying its customers. China’s Vivo, Huawei, and Xiaomi are going to introduce Smartphones that are equipped with Samsung Display’s Edge Display. Chinese news press reported on the 28th that China’s Vivo is going to release new Smartphone called ‘XPlay5’ that has Dual Edge Display. Image of XPlay5 was uploaded on Weibo’s Micro Blogging site. 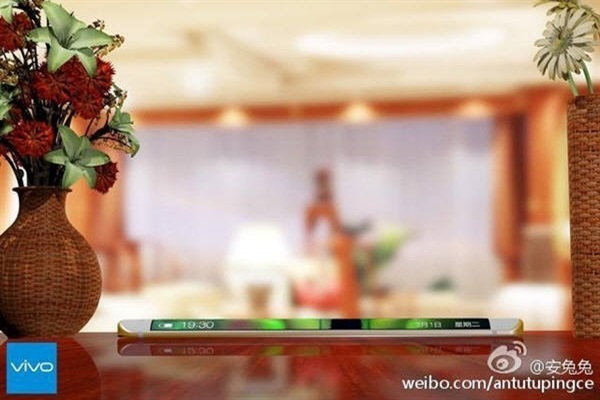 Although this is not a picture that was officially provided by Vivo, Chinese press believes that the picture represents XPlay5. Vivo introduced a teaser image that is associated with Dual Edge Display on Weibo’s Micro Blogging site lats week. Announcement of XPlay5 will be the 1st of next Month. XPlay5 is going to be equipped with 6GB Ram for the first time in the world. It is a flagship model that has Qualcomm’s Snapdragon 820 Quad-Core Processor. It is receiving attentions because it has Dual Curved Edge Display that is same as Samsung Electronics’ Galaxy S7 Edge. Edge Display is a model that is only mass-produced by Samsung Display. Although Samsung Display had been using it for only Samsung Electronics’ Galaxy models, it has been pushing for diversification of customers since last year. In flagship Smartphone market, Vivo’s XPlay5 is expected to compete against Galaxy S7 Edge. Industries are predicting that Huawei and Xiaomi are going to put out Smartphones that also have Edge Displays. This is a result of Samsung Display actively selling its Edge Displays to China’s Smartphone manufacturers. It has been heard since early this year that Huawei, Xiaomi, and Vivo had made supply contracts with Samsung Display and have been developing products. Samsung Display had gone through difficult times when it was first producing Edge Displays due to securing of yields and supply and demand of parts. However yield has been improved and supply and demand of parts has also been stabilized as time went on. As part of Samsung Display’s plan to expand AMOLED customers, industries believe that Samsung Display has been actively selling Edge Displays to foreign businesses. In 2014 when Samsung Electronics introduced Galaxy Note 4 Edge, Edge Display was considered as Galaxy Smartphones’ competitive edge in hardware. However as time has passed by, it quickly has settled as a type of OLED panel. After Galaxy Note 4 Edge was introduced, Samsung Display had supplied Dual Edge Displays to Blackberry for its Priv. Samsung Display’s current task is to secure variety of foreign businesses other than Samsung Electronics because Galaxy Smartphones’ growth has been stagnant and Chinese Smartphone manufacturers are quickly growing. Samsung Display had sold AMOLED panels mainly to Chinese Smartphone manufacturers during 3rd quarter of last year and made good results.